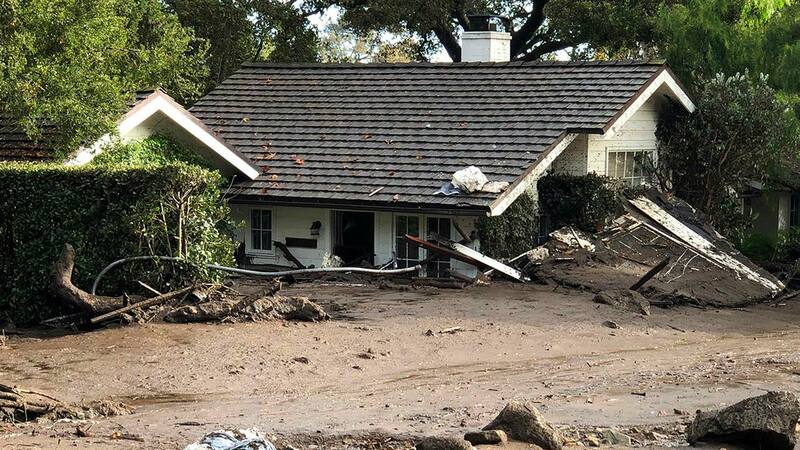 MONTECITO, Calif. -- California authorities say 100 single-family homes were destroyed in the flash-floods that struck the coastal enclave of Montecito and adjacent areas of Santa Barbara County. A county statement Wednesday says an additional 300 homes were damaged. Eight commercial properties were also destroyed and 20 were damaged. The death toll remains at 15, with 24 people missing. Twenty-eight injuries have been reported. The flash-floods struck in the early morning hours Tuesday when a huge amount of rain fell in a few minutes on hills and mountain slopes stripped bare last month by the largest wildfire in recorded California history. The fire destroyed more than 1,000 structures.